Tups loosed with the ewes on the in-bye (valley bottom land) in late November. 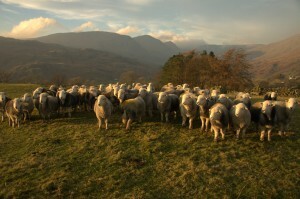 Around Christmas ewes returned to the fell, where they stay probably without additional feed until April. April-May: ewes lamb on the inbye. Ewes with single lambs put to the fell in May. Ewes with twin lambs kept on the inbye until after clipping time. July- August: all sheep clipped, starting with the geld sheep : i.e. sheep without lambs. September: lambs weaned from their mothers. Ewes returned to the fell if they remain fit for the purpose where they wait for tup time to come again. If they are too old to return to the fell they are either retained on the low ground of the farm for further breeding with a crossing tup (often a Texel, Charolais or perhaps a Cheviot) or they are sold as draft ewes to lowland farmers for the same purpose. October: wether (castrated male) lambs are either sold ‘store’ to lowland farmers to fatten or are sometimes fed on their own farms to fatten sometime before their first birthday.